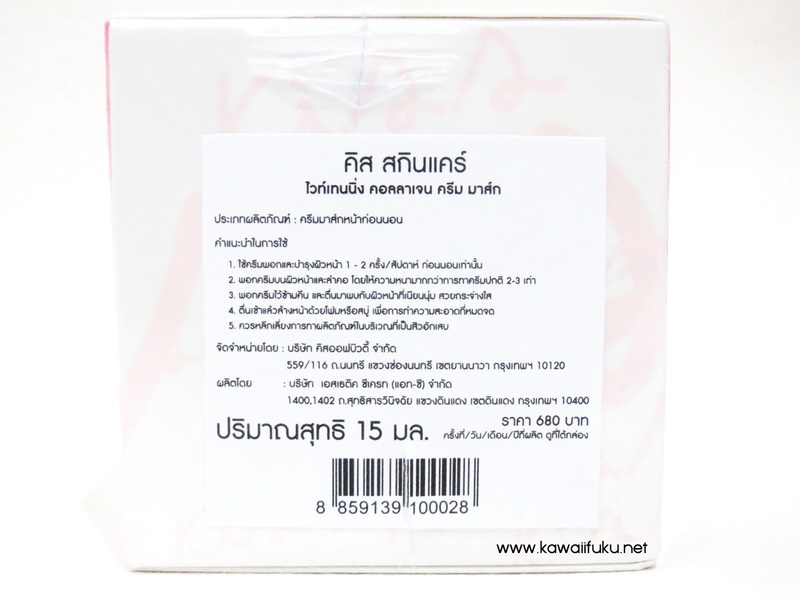 Thailand skincare is popular in Indonesia nowadays. 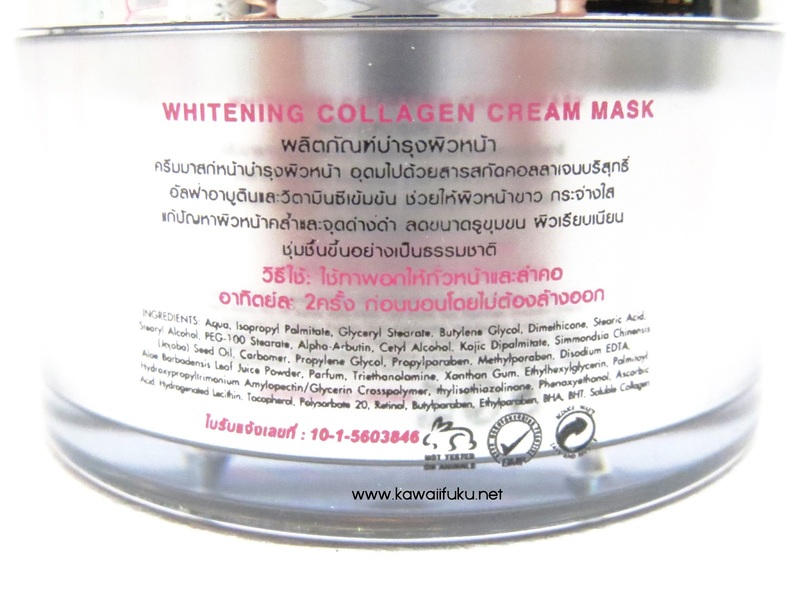 From moisturizer cream, whitening cream, until cream mask, and et cetera. And two brand that I often hear are PASJEL and KISS. 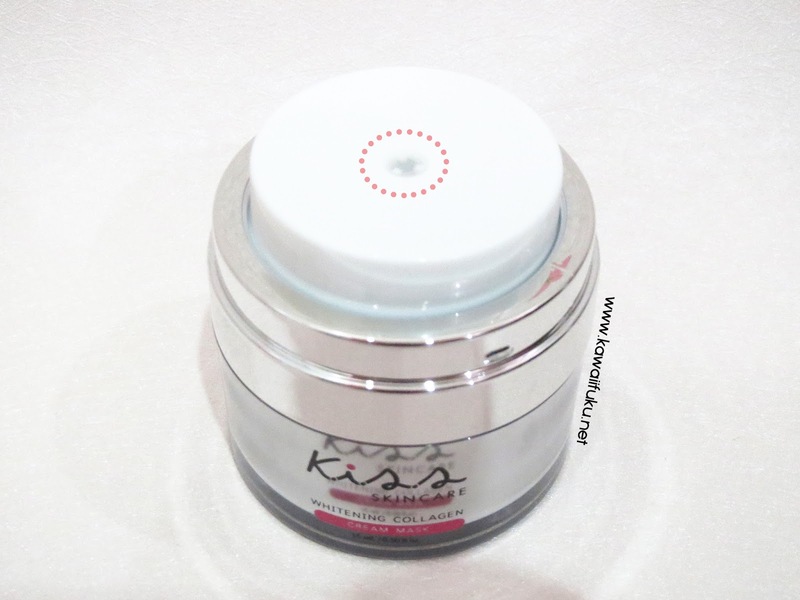 I have been eyeing this KISS cream mask since it was first introduced and sold in Indonesia. 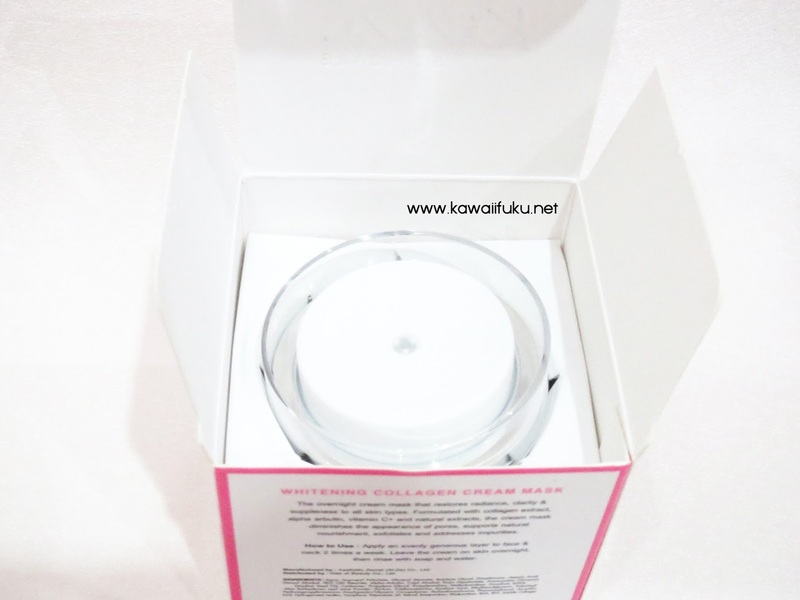 And thank you to BBlog and KISS Indonesia who gave me a chance to try this KISS Whitening Collagen Cream Mask in 15 ml. 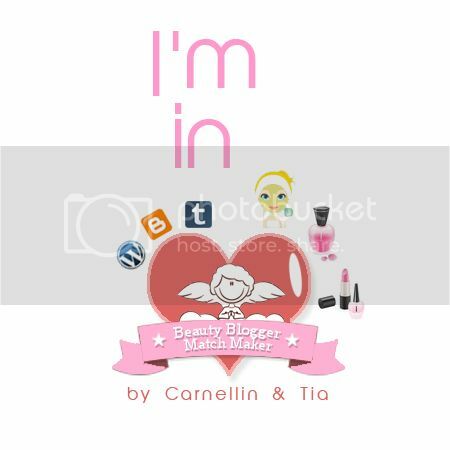 I'm just very happy to try it and share the review to my dear, kawaii friends. The product came in a sealed box and a label is attached on the seal. Containing information in Thai language, this label isn't very useful and informative for me as I don't know about Thai language and its meaning. On the other side of the box, you can find description of the product in English. Including how to use and the ingredients that also written in English. Once I open the box, I find that the container is secured with a carton inside. The container won't shake up and down and messed up while shipping (in case you bought this online). 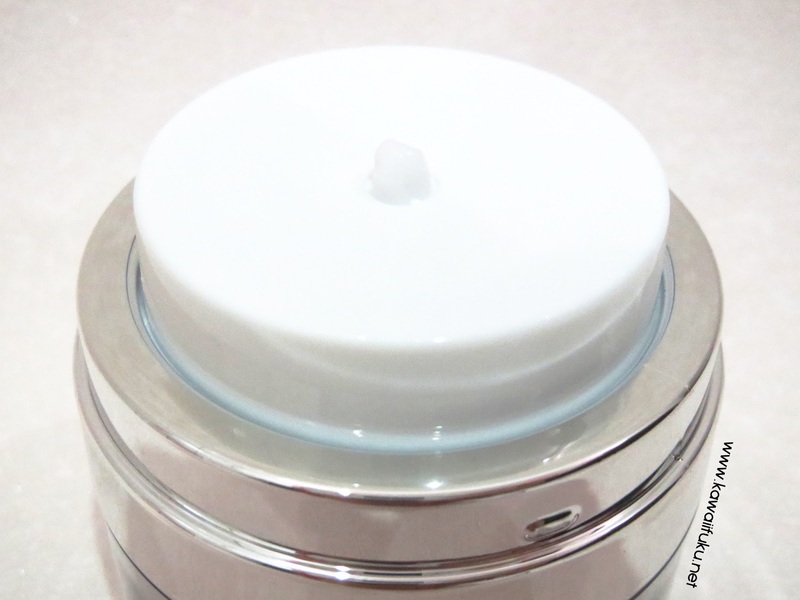 The cream mask comes in a pump container with a cap on the top of it. This is very hygienic, though I hope it would come in a see-through container. The container itself has a simple design, made by hard plastic and light-weight. Though this isn't a see-through container, you still can see the leftover cream inside by twist the lid on the middle of container. Once the cap is opened, you can see a plug in the middle of container. It's not clearly seen in the photo, but it is just a plastic plug. To using the cream mask, you need to unplug the plastic plug. After that, you need to press gently on the white surface to get the cream. Even with a gentle pressing, the cream will go out easily. For me, one deep pressing (or one deep pump) is enough to cover my entire face. This is how to use KISS Whitening Collagen Cream Mask. All you need is just apply cream mask onto your face at night, before you go to sleep. 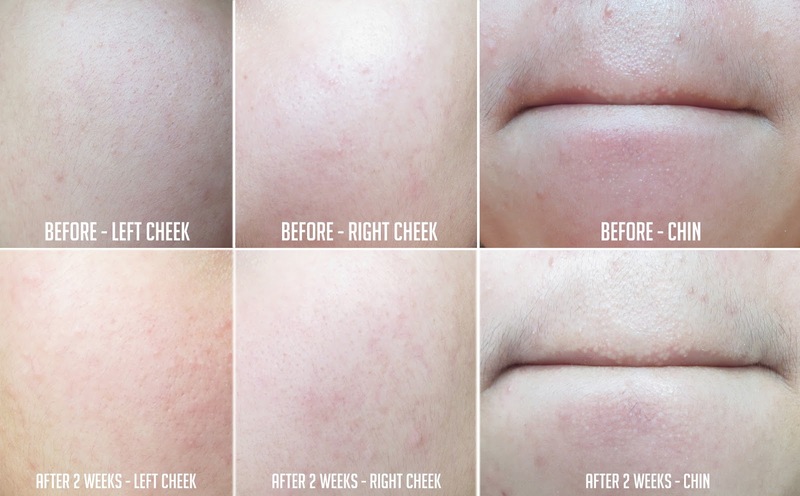 Don't wash it overnight, then clean your face with cleanser in the morning. I have redness both on left and right cheek. I also have visible pores, but it is not a problem for me. My chin looks horrible with acne scars, pimples, redness, and also visible white heads and pores. I still have redness on both of my cheek, but it seems reducing. Some of my acne scars are still there, still visible, but looks better. Overall, the result isn't visible after two weeks of usage. But my skin condition is improve. My face feels smoother and brighter. Though the result isn't visible enough after two weeks of usage, I'll keep using this sleeping mask twice a week and hoping for a better result in the future.